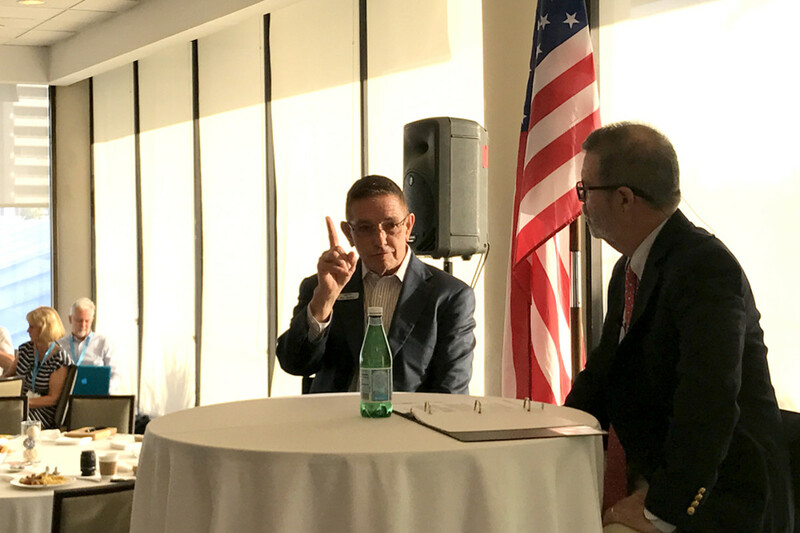 Soundings Trade Only editor-in-chief Bill Sisson conducted a question-and-answer session with MarineMax CEO Bill McGill at the marine industry breakfast this morning at the Bahia Mar in Fort Lauderdale. Seiler said Fort Lauderdale’s growth has been fueled by the marine industry, tourism and real estate, and today at the Bahia Mar and at six other sites the mood was buoyant — the marine industry leg of that tripod is flourishing. The marine industry is a resilient one, Seiler said — one that rides the economic cycles, the recessions and the weather challenges and “just keeps coming back,” he said. This year has been a “remarkable year” for marine businesses, and it shows in the anticipated numbers for this year’s show: more than 100,000 visitors, 1,500 boats and more than 1,000 exhibitors. The show has attracted eight boats larger than 200 feet, the largest 270 feet, he said, and there is a higher percentage of boats both under 80 feet and over 100 feet this year than last, said a Show Management staff member. Members of the marine industry gathered this morning for the industry breakfast at the Fort Lauderdale show. Zimbalist and MIASF executive director Phil Purcell praised the show as an entrepreneur-driven event that generates more than $500 million in direct sales and an economic impact of $850 million. “Private entrepreneurs coming together build this show,” Zimbalist said. The city of Fort Lauderdale supports the show. Show Management and MIASF put it on. Zimbalist said it’s a partnership. He said the show keeps evolving so that it’s more exhibitor- and visitor-friendly, and more entertaining. New this year: an American Pavilion, the rebranded Yacht Builders tent sponsored by the U.S. Superyacht Association, with 40 American-based companies serving the superyacht industry; a redesigned central food and beverage court presented by Great Performances; more exotic cars, submarines and a $7 million helicopter at the luxury “toys” expo at the Hall of Fame Marina; and a new VIP lounge at the Hall of Fame Marina, which is sold out. There also will be hands-on boating skills seminars that will take visitors out on the water, and diving, fishing and children’s classes presented by the International Game Fish Association, Zimbalist said. Between 7:30 and 8 p.m. today, Friday and Saturday fishing, boating and marine scenes will be projected to music on the side of the Bahia Mar to entertain guests. Purcell and Bob Swindell, CEO of the Broward Alliance, a business group, stressed the show’s potential for introducing corporate executives and business owners to the Fort Lauderdale area as a place to locate their companies. Purcell and Swindell also talked about how the wealthy people who attend the show, the yacht sales at the show and philanthropy support the large local complex of research institutions focused on fisheries, marine biology and ocean engineering. “South Florida is a marine research hub,” Swindell said. “Our intellectual capital is an amazing brand, and we need to tell that story,” he said. 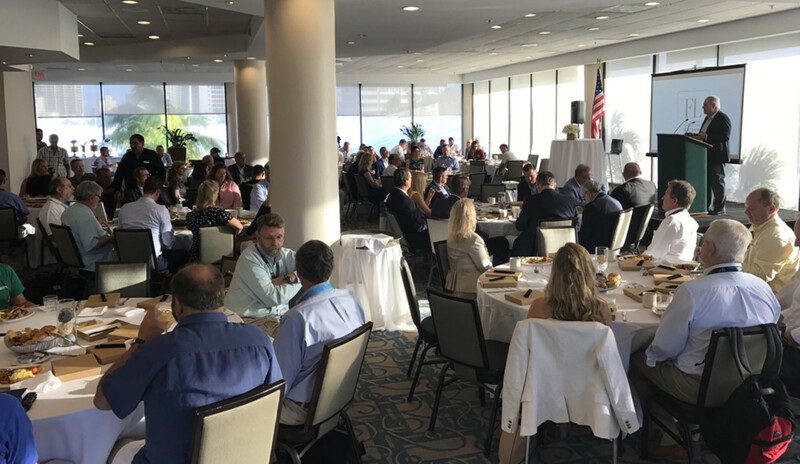 Swindell said the Broward Alliance will host a lunch, including speakers, during the show for visiting CEOs; the MIASF is hosting presidents from four local marine research universities to show them the opportunities they have to connect with philanthropists at the show. The Broward Alliance is hosting a Coral Reef Pavilion to showcase marine research in South Florida. MIASF president Danielle Butler said the show is not just about selling boats. It’s also about making important connections.